I am experienced in playing the Trumpet and Piano. I been playing both instruments for approximately over 25 years. I have an Associated Degree in Music Education. I have self-taugh myself Singing Alto, Guitar, Handbells, Organ, Percussion and French Horn for over 10 years. I started learning music at the age of 10. I initially started with Piano and eventually learned to play the Trumpet. 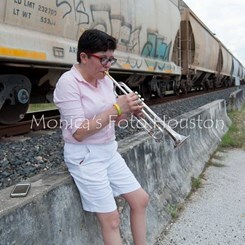 I play lead trumpet in a latin band called "Kingz1," 3rd Substitute Trumpet player for the "Houston Civic Symphony," and 1st/2nd trumpet player for the "Houston Pride Band." Request Lessons with Jennifer Watts today!